A Combination of Flue-cured, Burley and Oriental Tobaccos. A medium bodied blend, developed to be smooth and flavorful with no bitter taste on the palate. This is a satisfying blend of flue cured Gold Leaf, air-cured Burley and Oriental tobaccos. A light bodied, yet flavorful and smooth blend. 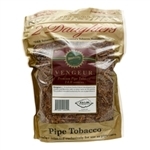 This premium pipe tobacco blend contains flue-cured Gold Leaf, air-cured Burley and Oriental tobaccos. This premium U.S. blend is medium bodied and contains the finest quality flue-cured Gold leaf, air-cured Burley, and Oriental tobaccos.